One experienced traveler makes a costly — and stressful — mistake. Here, a meticulous planner overlooks one crucial detail just weeks before a trip to Iceland. I consider myself an experienced traveler and I love to plan. So for our 30th birthdays, I took a year and a half to plan a weeklong trip to Iceland with six friends. Three weeks before takeoff, I had hour-by-hour itineraries, grocery lists, expense trackers, and even a temporary garment rack set up to cordon off my trip clothes. I was beyond confident. So naturally, the universe brought me down a peg. While lazily scrolling through Instagram, I noticed my favorite travel guru, Rick Steves, had just released an Iceland guidebook. Even though we’d already booked our activities, I immediately bought it — you don't turn your back on country-specific advice from Rick Steves. When it arrived a couple days later, I tore in. "You'll have a smoother trip if you tackle a few things ahead of time," Rick told me. Number one: Make sure your passport is valid. I grabbed my passport. As I joyfully leafed through the pages, admiring my stamps, I realized my passport had expired … six months ago. Between booked tours, flights and lodging, almost $2,000 was on the line. The good thing about a government documentation crisis? There are rules. After a free-fall into a Google hole of advice, opinion and tall tales, I headed to the official government source. Travel.State.Gov is clearly built for manic travelers in crisis mode. Before the site finished loading, I was dialed into their help line while clicking on everything — appointment slots, forms, FAQs. Faster than I expected, an actual person patched through. Her name was Terry. Using a special processing calculator, Terry cut through the noise and advised me to complete expedited passport renewal by mail. If my travel date was even a day sooner, I'd have to renew at a passport center. Expedited Passport Renewal by Mail is a quaint way to describe the next week of my life: days of driving, confusion and paperwork, all punctuated by a sense of dread. The confidence boost I gained from my Terry talk faded an hour later at picture time. At CVS I had a bit of a meltdown when the pictures came out insane and the gravity of the situation truly sunk in. “Don’t show teeth,” they said. “Don’t smile,” they said. “Tuck your hair behind your ears,” they said. I went home with my terrible photos, died a little, then picked myself up and headed to Rite Aid for an immediate reshoot. Vanity aside, passport photo requirements are no joke and can cause your renewal to be rejected. Understand the rules, as pharmacy photo staff may not. Expedited service uses a different mailing address than routine service. Checks are payable to U.S. Department of State, and your full name and date of birth must be typed or printed on the check. For faster processing, write "Expedite" on the mailing envelope. Passport renewal turned into a two-day event when I realized I needed a printer and stapler to complete the arts and crafts portion of my personal travel nightmare. Midway through day two, I visited my local post office, because only the U.S. Postal Service can deliver to P.O. Boxes, where this form needed to go. I dropped some more cash on overnight delivery and just like that, it was finished. The third time I called the National Passport Information Center, they nicely told me to chill. Once your renewal is received, it can take up to five days to get into the processing center. At that point, you get a tracking number and can follow along online. A week after mailing away my passport, I got my online tracking number and received the all-clear; she was on her way. I had done it. 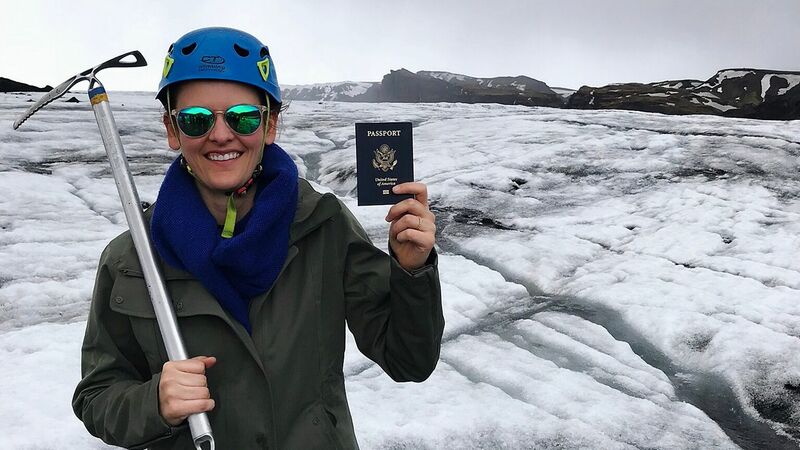 After a week of confusion, dread and unexpected costs, Claire renewed her passport in time for her 30th birthday trip to Iceland. Check your passport now and mark your calendar for your renewal. You can be denied foreign entry if your passport is set to expire within six months of travel, so don't cut it close. Don’t jump at the first thing you read or hear. There’s a lot of misinformation in public opinion. Even so-called experts taking my passport photo or at the post office had incorrect information. You are NOT required to tuck your hair behind your ears in your photo. This myth, combined with an outrageous overhead lighting situation, made me look legit nuts. Don't let your failure paralyze you. After my debacle, I found out a friend of mine showed up to the airport with an expired passport and got on a new flight within 24 hours. It'll cost you, but it can be fixed! Rick Steves is an American treasure and my guardian angel. If he wasn’t always preaching travel fundamentals, I wouldn’t have checked my passport. I'll never let you down again Rick, I promise.